Disclaimer: the comments and opinions expressed in this review are the results of our own (limited!) experience with the product. As always, we try to provide context to give a fair overview of the product. We strive to remain impartial and unbiased, and we have not received any payment or compensation of any form for writing this article. The manufacturer lent us a Shining 3D EinScan-SP (Platinum) 3D scanner for free. Today, we‘re testing the Shining 3D EinScan-SP, a desktop 3D scanner. This article aims to give a fair evaluation of this affordable 3D scanner through the 3D scanning of standard 3D objects. During this 3D scanner review, we will follow our standardized protocol to evaluate the performance of this product. Founded in 2004, Shining 3D is the #1 company on the Chinese stock exchange for the 3D digitizing and 3D printing industry. The company’s headquarters are located in Hangzhou, and there are branches in Shanghai, Beijing, Guangzhou, and several other major Chinese cities. Shining 3D became renowned for their offer of affordable yet efficient 3D scanners, starting with the Einscan-S desktop 3D scanner, which this EinScan-SP replaces. The added ‘P’ in EinScan-SP stands for Platinum. Shining 3D’s lineup of desktop 3D scanners is based on structured light technology. The basic principle: a video projector casts a light pattern on a 3D surface that modifies the pattern in a specific way. This deformation is captured by the sensor and allows the software to calculate the 3D surface’s topology and to create a 3D mesh. Structured light 3D scanning technology (animated). The GIF above displays the different steps for the 3D scanning process with structured light technology. The first image is black and white stripes, then red, green and finally blue before the automatic turntable rotates 20°, and the cycle restarts for another capture. Our Shining 3D EinScan-SP 3D scanner setup. 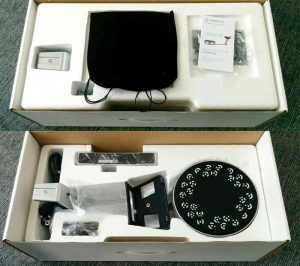 Shining 3D offers two relatively similar products that are based on the same design architecture: a fixed sensor which is also a projector, a solid frame, and an automatic turntable. At only $1,199, the all-black EinScan-SE (Elite) is cheaper than the EinScan-SP (Platinum), but it is two times slower. The EinScan-SE also provides a smaller 3D scanning volume, with only 200 x 200 x 200 mm for an automatic turntable 3D scan, and 700 x 700 x 700 mm for a manual 3D scan. For those interested in the technical characteristics, we wrote a side-by-side comparison of the EinScan 3D scanners. The Shining 3D EinScan-SP packaging. The Shining 3D EinScan-SP is delivered in a thick transportation cardboard box which contains a secondary packaging cardboard box. The secondary packaging cardboard is nice-looking and comes with a plastic handle for transportation. The product and its accessories are well protected, but if you intend to move your EinScan-SP around often it would be wise to invest in a rigid transport case. Some competitors offer this for free, but for $2,299, a price including the automatic turntable, it is difficult to blame Shining 3D for this absence. Every item neatly fits into a dedicated pocket-hole made inside a thick styrofoam and is further protected by a thin plastic wrapping. The sensor itself is small, compact and only requires to be assembled with its fixing structure (the plastic trapezoid part visible at the center bottom of the picture) before being coupled to the 3D scanner frame. Note that thanks to this soft and flexible part, it is possible to connect the EinScan-SP to almost any tripod sold for regular photo cameras. The EinScan-SP package includes a quick start guide printed on a small brochure. This guide, written in English, describes in simple words how to get started and how to use the 3D scanner. 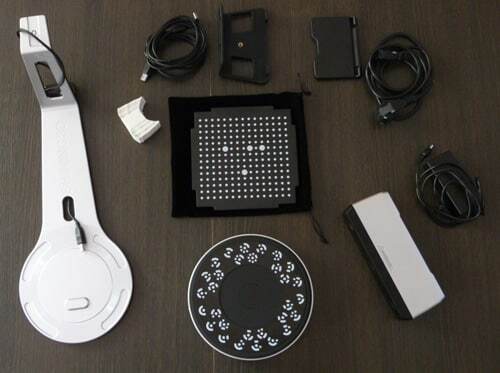 The detailed illustrations help in assembling the different parts of the 3D scanner and connecting the three cables in a matter of minutes. and the quick start guide. The Shining 3D EinScan-SP accessories. The calibration panel bears markers on one side while being totally white on the other, making it suitable for the calibration of the 3D scanner and for performing white balance adjustments. The Shining 3D EinScan-SP can be operated under Windows and Mac operating systems. For this test, we used a Lenovo laptop fitted with a decent GPU, a Nvidia Quadro M2000M ‎4096 Mb, a Solid State Drive, 16 Gb of RAM and an Intel Core i7-6820HQ @ 2.70 GHz. The software can be directly downloaded from the EinScan dedicated website and is simply called EinScan. Software installation is very fast and can be completed in a few minutes. For this test of the Shining 3D EinScan-SP, we started by installing EinScan v2.3.3. We noticed that EinScan v2.5 Beta was also available, so after a few tests we installed it as well. However, in this version, there seems to be an issue with the 3D scanner detection and licensing (only the EinScan-S and EinScan-SE were available for selection). After a few tries, we went back to the v2.3.3 with which this review has been conducted entirely. EinScan 3D software, used for the whole 3D scanning process. When first launched, the software starts with a succession of basic configuration panels. They let the user pick their 3D scanner model from the EinScan range. Once we selected the EinScan-SP, we were able to choose between 3D scanning modes (with or without the automatic turntable). The Shining 3D EinScan-SP is a well-manufactured product that proffers a nice, sturdy feeling. It almost feels as good as a standardized consumer electronic product, as the different parts of the 3D scanner- either made of plastic (such as the automatic turntable or the sensor) or made of metal (the frame)- appear to be clean and of quality. Everything has been optimized to be easy and intuitive to assemble. Putting all of the parts together only takes a few minutes without even having to read the quick start guide. Left: the complete 3D scanner. Right: the sensor. We noticed that the USB cable between the automatic turntable and the sensor has been poorly integrated into the design. However, this is not a big issue since it is possible to use a non-proprietary tripod with the sensor’s standard photo camera screw. The hardware assembly of the Shining 3D EinScan-SP is fast, intuitive and straightforward. All that is needed is to attach the sensor to its plastic support and then attach it directly to the frame. The automatic turntable can simply be positioned on its dedicated slot onto the frame. It is then to be connected to the sensor via USB. From the sensor itself, there are two additional cables: the power cable that needs to be plugged into an AC outlet, and an additional USB cable that connects directly to the computer. Note that the EinScan-SP only requires a single USB port on a computer. This is a huge competitive advantage since other products often require up to four! Almost no warm-up time is required to use the EinScan-SP- as soon as the 3D scanner is plugged in and the software is launched, it is possible to start 3D scanning. TheShining 3D EinScan-SP calibration process. 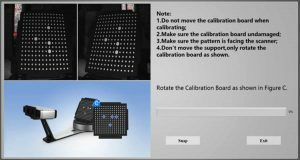 The calibration step is available on the “Mode selection” panel, where it is possible to choose to 3D scan with or without the automatic turntable. The calibration process itself is well explained and linear but requires caution when positioning the heavy calibration plate. Three different orientations are required. It is recommended to launch the calibration procedure every time the 3D scanner is moved. The EinScan software is quite efficient and straightforward to use, but it has a few flaws. First of all, let’s start with the positive aspects: the software is very intuitive to use, even for beginners. 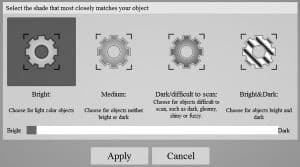 The first menu lets the user pick the 3D scanner model (in our case an EinScan-SP) and then select the mode, with or without the automatic turntable. For our 3D scans, we always used the turntable to get a good grasp of the hardware and software performance for 360° captures. EinScan software use case configuration. The main configuration options revolve around finding the best lighting for a specific type of object or use case. Simply pick the best match and the software will optimize capture settings for the given conditions. In the main panel frame, wide icons give a quick-look access to the main functions such as 3D capture, parameterization of the 3D scanner, re-meshing, save and export, etc. It’s impossible to launch the EinScan software without first connecting the EinScan-SP to the computer. This is very cumbersome because the 3D capture of the object is often not the most time-consuming step of the process- the mesh export and optimization usually takes longer. To a certain degree, the software feels like a collection of functionalities glued together without a real backbone. For most use cases it does the job, and quite well, but as soon as we venture into uncharted space, it doesn’t go so well. This is mainly due to a flickering performance, even on a powerful laptop like we had. 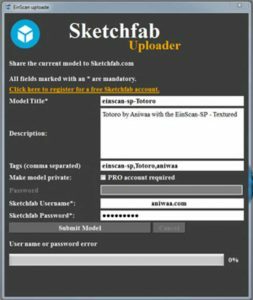 EinScan software: integrated export to Sketchfab. When exporting, it is possible to choose between multiple file formats, including .ASC (whole), .ASC (separate), .STL, .PLY, .OBJ, .P3, and .3MF. It is even possible to export directly to Sketchfab through a dedicated interface included in the software. We tried to use this functionality, without success. As a result, we stuck to the .OBJ save and uploaded our 3D models directly through Sketchfab’s website. Once assembled and calibrated, the EinScan-SP is ready to go! For most objects that are easy to 3D scan, everything goes fast and smoothly. It only takes a few rotations of the automatic turntable to fully acquire most of the part’s surface. A simple orientation change will allow capturing the forgotten zones, such as the top of the part or its base. Thanks to the automatic realignment, it is quick and easy to obtain a great result. However, the user must be careful with the parameters because the size of the generated meshes grows exponentially, and this might push some computers out of their comfort zone. We experienced a few freezes, forcing us to avoid the maximum resolution. The slow mesh modification speed also explains why the score is not perfect. However, the user must be careful with the parameters because the size of the generated meshes grows exponentially, and this might push some computers out of their comfort zone. We experienced a few freezes, forcing us to avoid the maximum resolution. The slow mesh modification speed also explains why the score is not perfect. 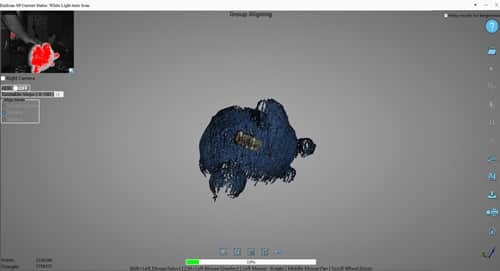 Totoro structured light 3D scanning process (animated). Since the standard workflow went very well (except for the small performance issues), we decided to test more demanding situations. We tried to recover a previously generated 3D scan to do some modifications. This won’t work without first connecting and switching the EinScan-SP on. Using the software for this nonlinear workflow proved to be a lot less intuitive. Consequently, we had to tinker a bit in order to obtain good results. This cute Totoro plush is an interesting object to 3D scan. Indeed, it is highly detailed with a difficult material and challenging details (including small hanging parts). The result is very satisfying with a nicely rendered fluffy texture and surprisingly good colors. The software automatically aligned most of the meshes, but in some cases, we had to manually align them. The functionality is well-designed and the final 3D scan was completed and saved in a few clicks. This Bluetooth speaker is a very interesting object to 3D scan. Measuring approximately 50 x 50 x 250 mm, it is slightly larger than the recommended 3D scanning zone. A 3D mesh of the Bluetooth speaker. After a few tries without markers, we decided to stick a little over 50 markers (Shining 3D provides 5000-6000 markers) on some on the most difficult surfaces, the reflective black ones. This improved the capture, although it was still impossible to obtain a watertight model without losing all mesh refinement and detail. However, we exported the file to SolidWorks and it proved to be a great reverse-engineering blueprint. This 3D printed heart was made by the young start-up Biomodex, using a Stratasys J750 color 3D printer. It is roughly 150 mm tall and was scanned on its plastic support. We obtained this result with only one iteration and no modification to the original mesh. The resulting quality is very impressive, with a detailed mesh and clean textures. This rock is about 100 x 50 x 70 mm. It was chalk-like, with a lot of yellowish/greenish spots all around. The result is a well-detailed mesh obtained with only 3 different orientations. The software automatically did the realignment. However, the yellow became green and the textures almost appear to be fluorescent. Priced at $2,299, the Shining 3D EinScan-SP is definitively a very interesting product. This 3D scanner is $1,100 more expensive and twice as fast as the EinScan-SE (offered at $1,199). The EinScan-SP is almost as powerful as the EinScan-Pro+ which has an entry price tag of $5,698 with texture (color capabilities). Our overall rating reflects our experience with the Shining 3D EinScan-SP (Platinum) 3D scanner, in the specific uses cases described. In general, it is very difficult to find 3D scanners with an optimized user experience, even more for this small budget. However, the Shining 3D EinScan-SP does a good job and with a few updates, its software will be as optimized as its hardware. In this price range, there are only a few alternatives. Its biggest challenger would be the cheaper EinScan-SE 3D scanner, suitable for less demanding users. The Shining 3D EinScan-SP 3D scanner is a very good product- affordable yet powerful. It is a great match for small and medium-sized businesses such as design and architecture studios. Besides, even museum conservationists and curators could gain a good profit from the EinScan-SP’s capabilities. Additionally, it can be a very interesting option for light reverse-engineering jobs or prototyping. The main downside of this product is its slightly confusing software, but Shining 3D often does useful updates. Users can understand how to use it in minimal time. Finally, as mentioned earlier, there are not many alternatives to the Shining 3D EinScan-SP at this price point of $2,299. The RangeVision Smart is more expensive but offers a slightly better performance, notwithstanding its difficult-to-use software. The DAVID SLS series is powerful and also more expensive (it doesn’t include an automatic turntable), but won’t offer a much better performance. Furthermore, their user experience is also quite complex. In the end, the biggest threat comes from Shining 3D’s own EinScan-SE which is slower and less powerful but spares $1,100. We carry out tests of 3D printers, 3D scanners, and 3D filaments. Get in touch if you’d like us to review your products!